All the flavors you love of your favorite stuffed peppers, without all the time it takes to make them! 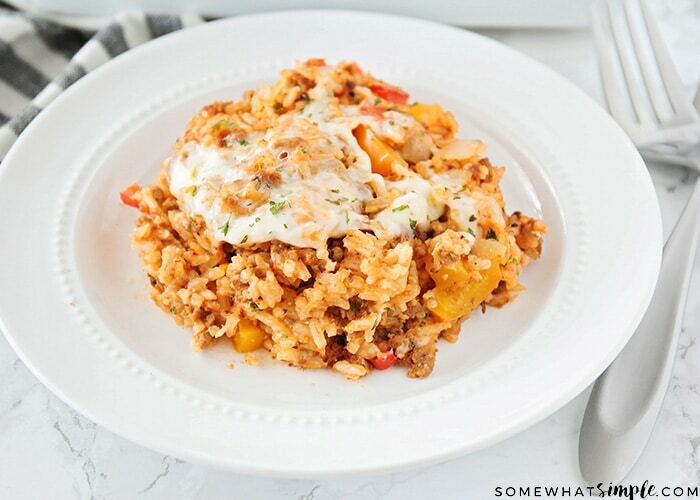 This Stuffed Pepper Casserole is an easy recipe you can whip up in about 30 minutes! 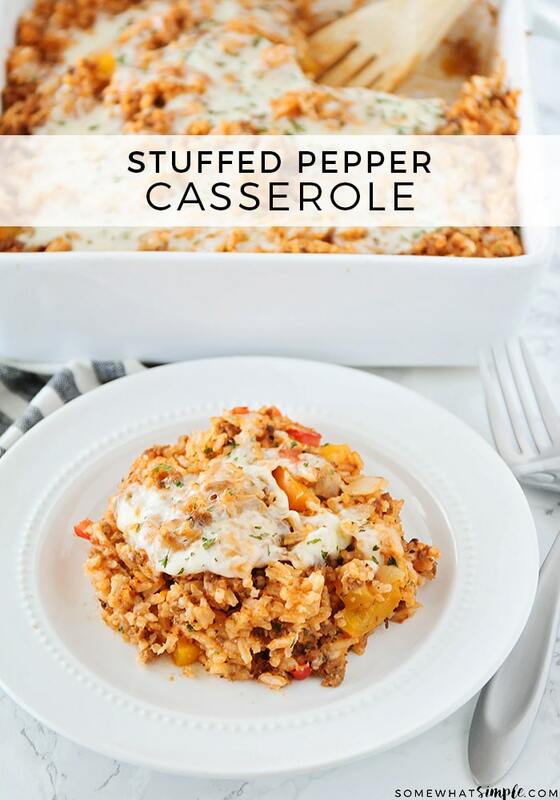 I love to serve this stuffed pepper casserole with a side of delicious roasted vegetables, a batch of warm homemade dinner rolls or a spinach salad to complete the meal. 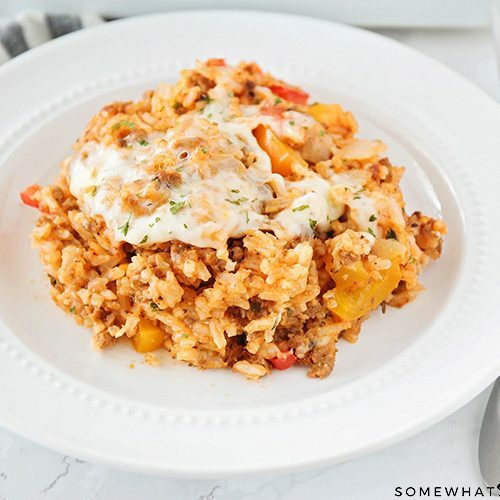 This easy casserole will give you all of the delicious flavors of a stuffed pepper dish without having to spend all day in the kitchen! It’s easier to make than regular stuffed peppers, AND it’s so much easier to eat too! You don’t have to figure out how to eat through the tough pepper skin and get an even distribution of the filling! 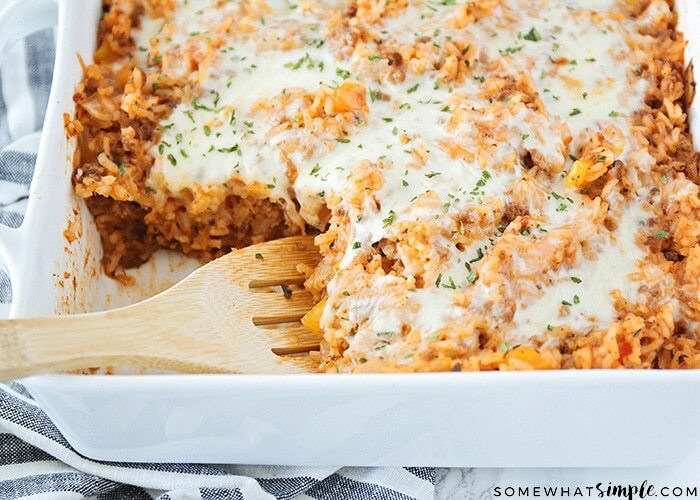 This casserole has all the same great tastes without all the hassle! Can I Freeze Stuffed Pepper Casserole? 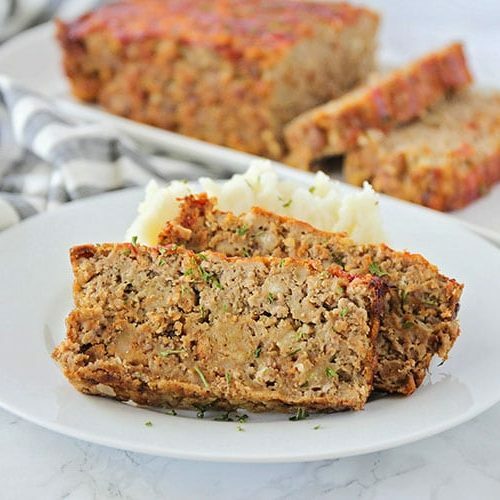 Yes, you can definitely freeze this meal. In fact, sometimes I cook two pans and put one batch in the freezer to use on another busy night. Once cool, be sure to place the casserole in an airtight container before freezing. I recommend eating it within three months of making it. To thaw, place the stuffed pepper casserole in the refrigerator overnight and use within a couple of days. This easy stuffed pepper casserole will give you all of the delicious flavors of a stuffed pepper without having to spend all day in the kitchen to make them. In a large saute pan, add your olive oil, diced pepper, diced onion and minced garlic over medium high heat and cook for about 5 minutes until the veggies just start to get soft, stirring often. Add in your ground meat and cook until the meat is cooked through. Drain grease out of your pan. Add in your Italian seasoning, salt, tomato sauce, rice and 1/4 cup mozzarella cheese stir together. Pour everything into a large baking dish and top with additional 1/2 cup of mozzarella cheese. Cover with foil and bake in oven for about 25 minutes. Remove foil and bake for an additional 5 minutes or so until cheese turns golden. 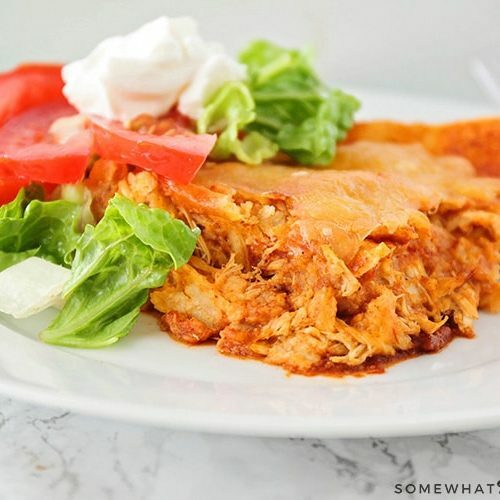 A few more EASY dinner ideas you will LOVE! This is definitely a must-make!! Looks SO good! Such a yummy weeknight dinner! Making soon! I made this for my family and they really enjoyed it. Thanks for the great recipe. You’re welcome…so happy to hear it was a hit! Love how filling this dinner is! My whole family loves it. Such a great idea to double it and freeze half. That’ll help get dinner on the table on a busy weeknight. I was looking for a casserole that was like stuffed bell peppers because I had a limited supply of peppers to create original stuffed peppers for my son and his family. This recipe was a big hit. I did add 1 Tablespoon of Worcestershire sauce, 1/2 teaspoon black pepper, and did a 1 and a half cups combination of mozzarella and cheddar cheese. It is definately a keeper! Thanks for the recipe. I’m so glad you loved the recipe. It’s one of my favorites! 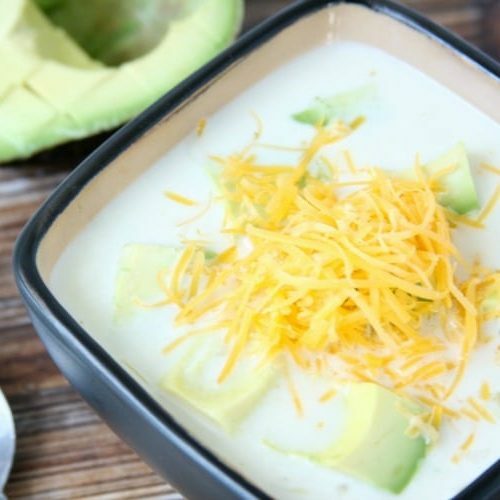 Sounds yummy…a perfect fall/winter meal. Can wait to try it. It’s really delicious! Let me know how it turns out when you try it. Thanks for stopping by!